All year long, deep funk bands have been sharing the spotlight, from the Dap Kings’ work on Amy Winehouse’s Fade to Black to the Scion Live Metro series. 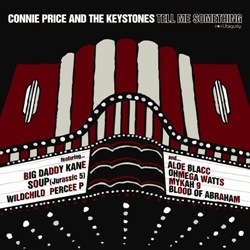 Connie Price & the Keystones, an L.A. crew led by multi-instrumentalist/producer Dan Ubick and Todd Simon, has been a consistent presence on the latter project. Although the latest Scion Live Metro tour — a brief, four-date jam with Connie Price & the Keystones and Brand Nubian — is nearly over, fans in Minneapolis can see the show tomorrow night (Thurs., Oct. 25) at the Varsity Theater. The rest of the world has CPK’s second album, Tell Me Something, to look forward to. Set for release on January 22, 2008 via Ubiquity, Tell Me Something reunites the troupe with several other Scion Live Metro veterans, including Big Daddy Kane and Percee P. The album is split into two discs: a vocal version with a slew of rappers, and an instrumental version for all the DJs and funk lovers. The track listing for Tell Me Something is below. This entry was posted in News and tagged Connie Price & the Keystones, Ubiquity Records. Bookmark the permalink.